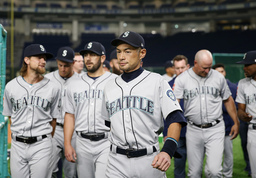 Ichiro Suzuki had it on a night to celebrate all things Ichiro - "Ichiromania" in other words - as he started for the Seattle Mariners against the Oakland Athletics in MLB's opening game of the season. A half-dozen fans lined up just behind the third-base dugout and held up cards spelling out his name in Japanese. Another wore a shirt that read: "Ichiro I believe - 3,090."